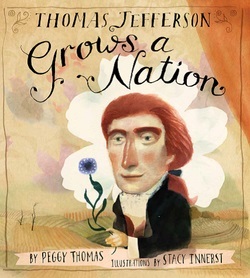 ﻿Thomas Jefferson as you've never seen him before! Thomas Jefferson was more than a president and patriot. He was also a planter and gardener who loved to watch things grow—everything from plants and crops to even his brand-new nation. As minister to France, Jefferson promoted all things American, sharing corn and pecans with his Parisian neighbors. As secretary of state, he encouraged his fellow farmers to grow olives, rice and maple trees. As president, he doubled the size of the nation with the Louisiana Purchase. Even in his retirement, Jefferson continued to nurture the nation, laying the groundwork for the University of Virginia. Back matter includes an author’s note on Jefferson’s legacy today; timeline, bibliography; place to visit (Monticello); and source notes.